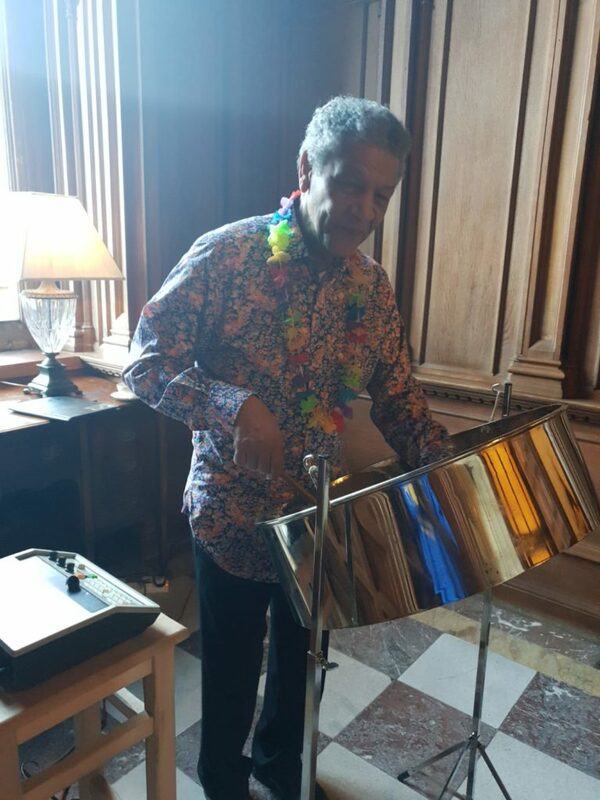 We were greeted with a glass of rum punch on arrival, and were entertained by musician, Eugene, playing a steel drum, all of which set the tone for the fabulous display created by Rampage, demonstrating their expertise in carnival costume. Over 50 Feltmakers and friends gathered at Luton Hoo on Thursday 21 February for the annual Luton Lunch. 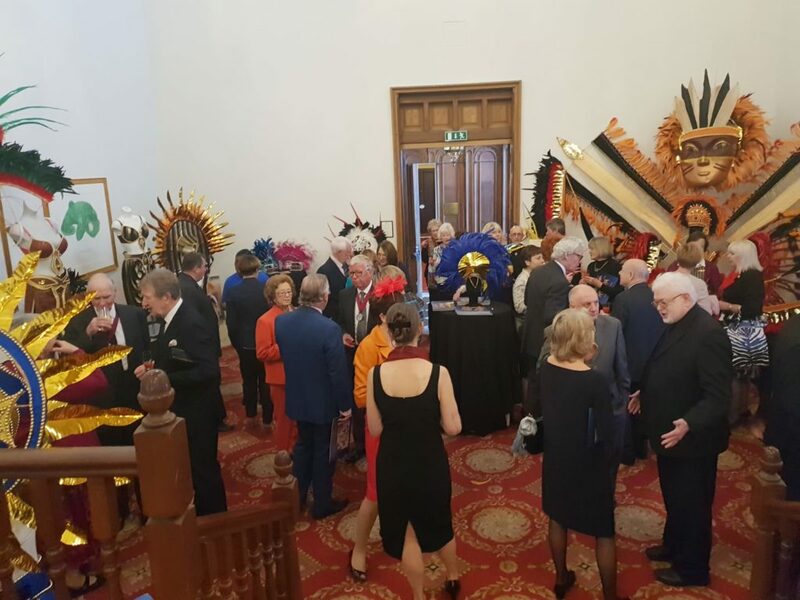 Court Assistant, John Horn, had once again organised an excellent event that was held for the second year in the beautiful Romanov Suite at Luton Hoo. Rampage (CIC) is the UK ‘s foremost exponents of Caribbean style carnival arts; their tours attract thousands of people worldwide. Each year a new theme is created and all costumes are designed to showcase that topic. 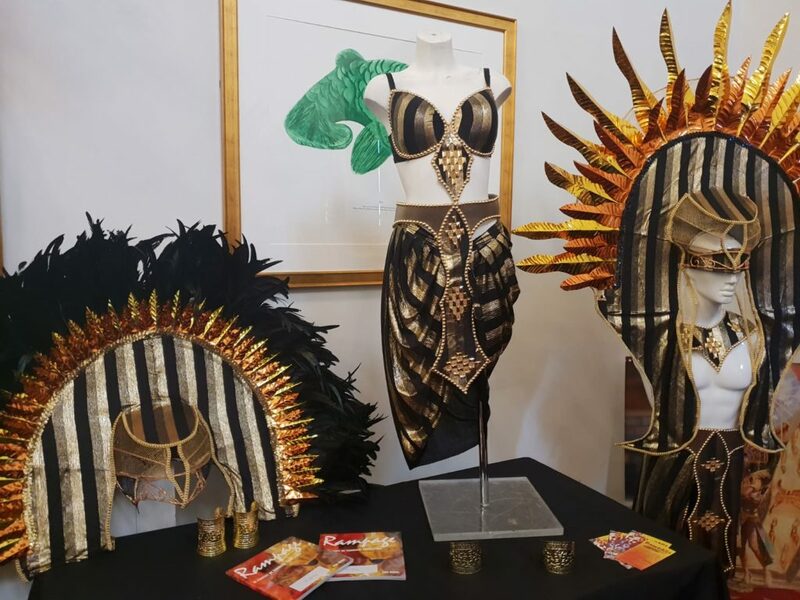 Their theme for this year is Egypt and you can see from the photographs that all aspects of this theme are covered and have been given the special Rampage touch to make the costumes perfect for carnival. The vibrant and exotic flavours of the Caribbean Islands were carried through to the delicious food. We began with grilled swordfish skewers, served with a papaya and scotch bonnet salsa and pickled ginger. This was followed by Jamaican jerk chicken, pea & coconut rice, crushed sweet potatoes and rum sauce and we finished with roast pineapple, a coconut sorbet with mango curd and passion fruit preserve. As we sat back to enjoy our coffee and petit fours we listened to three of the Directors of Rampage, Sharon Burrowes, Stephen Hoyte and Annemarie Williams, who explained how they had got involved with the group (through their children!) and how their passion and commitment grew. Their work very much involves engaging young people and teaching them skills and encouraging their continued participation. The company now travels around the UK showcasing its artistic work, participating in carnivals all over the UK and extending into Europe, they visit Aarlborg in Denmark every year! All agreed that they were talented and inspiring and we felt privileged to have listened to their stories. John thanked everyone for attending with special thanks to Vivianne Vayssieres and also to John’s wife, Christine, for their help in organising the day. The lunch ended with Master William Gammell thanking our speakers and with special thanks to John for organising and hosting such an entertaining lunch.